The graph vividly illustrates one of the biggest benefits of the U.S. energy revolution. First, it plots soaring U.S. net petroleum imports, which peaked at 60.3 percent in 2005, and then logs the plunge to just 12.1 percent last year. The thing that caught my eye in Perry’s tweet is that the time frame for his graph, 1957-2018, is pretty much the span of this blogger’s life. Most importantly, in one generation, the United States has gone from steadily growing energy dependency to a nation that’s largely in control of its energy destiny. It’s a turnabout many of Americans never thought possible. Remarkable. Breathtaking. Or, as Perry tweets, amazing. And production is expected to grow. The U.S. Energy Information Administration (EIA) projects domestic crude production will average 12.4 million barrels per day (mb/d) this year and 13.2 mb/d next year. The International Energy Agency said recently that U.S. crude output would probably be more than the capacity of either Saudi Arabia or Russia by the middle of this year. Let that sink in. Lots of Americans who remember odd/even gasoline-buying days in the 1970s doubted they’d ever see a day when the United States, its economy and its future wouldn’t be so beholden to oil imports from other countries. That day began to arrive with the lift-off of American energy revolution – roughly coinciding with the drop in net petroleum imports depicted in Perry’s chart. And, of course, the energy revolution stems from the advent of advanced hydraulic fracturing and modern horizontal drilling, which unlocked vast reserves of natural gas and oil trapped in shale and other hard rock formations. This is where we are today. 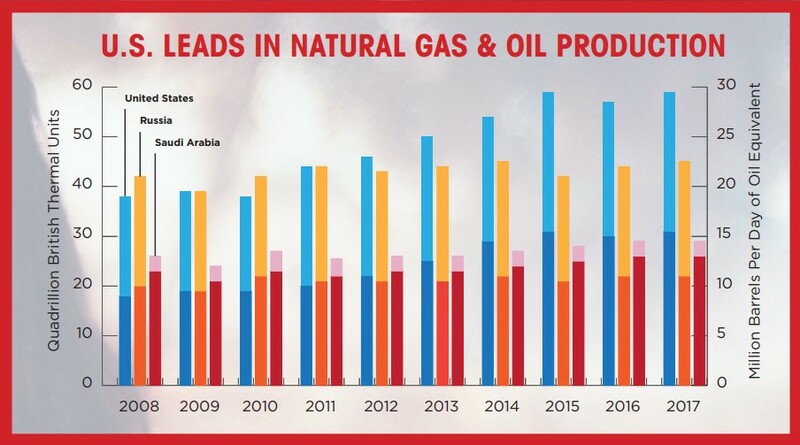 Freer and more secure as a nation, able to plan for an optimistic future and global leadership because of abundant, secure domestic natural gas and oil – projected to be the leading energies for the U.S. for decades to come.